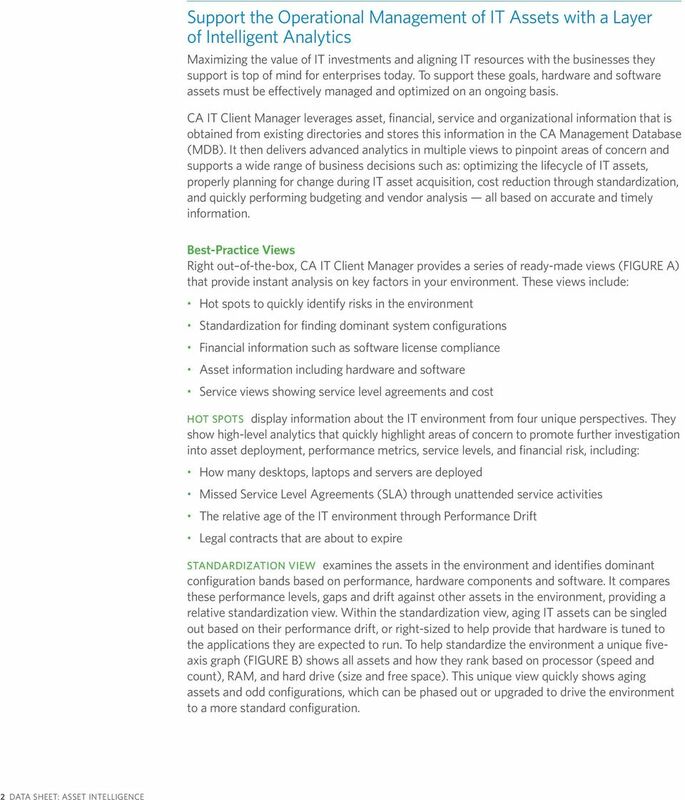 Download "CA IT Client Manager. 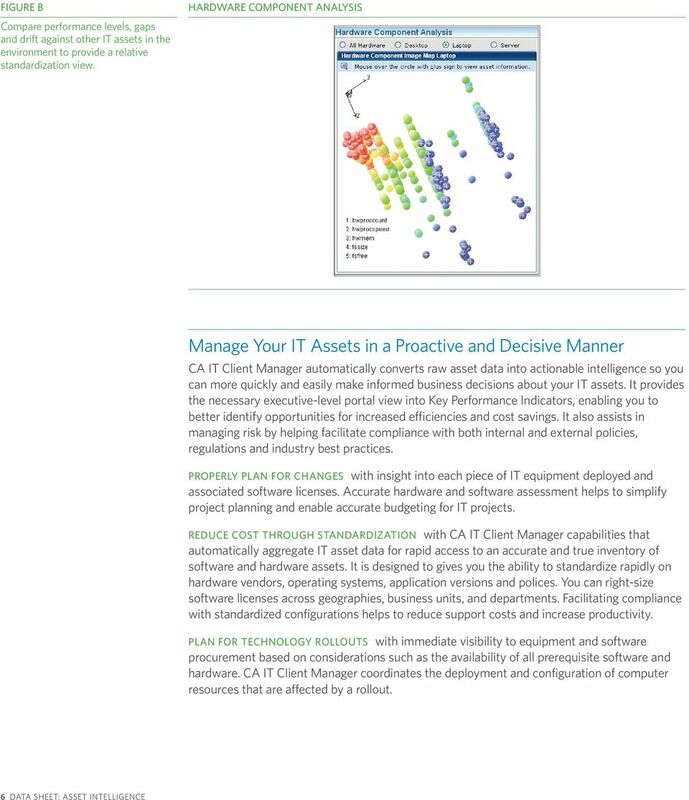 Asset Intelligence"
1 DATA SHEET: ASSET INTELLIGENCE CA IT Client Manager Asset Intelligence CA IT CLIENT MANAGER AUTOMATICALLY CONVERTS RAW ASSET DATA INTO ACTIONABLE INTELLIGENCE SO YOU CAN QUICKLY IDENTIFY OPPORTUNITIES FOR INCREASED EFFICIENCIES AND COST SAVINGS, AND MAKE INFORMED DECISIONS THAT SUPPORT YOUR BUSINESS NEEDS. 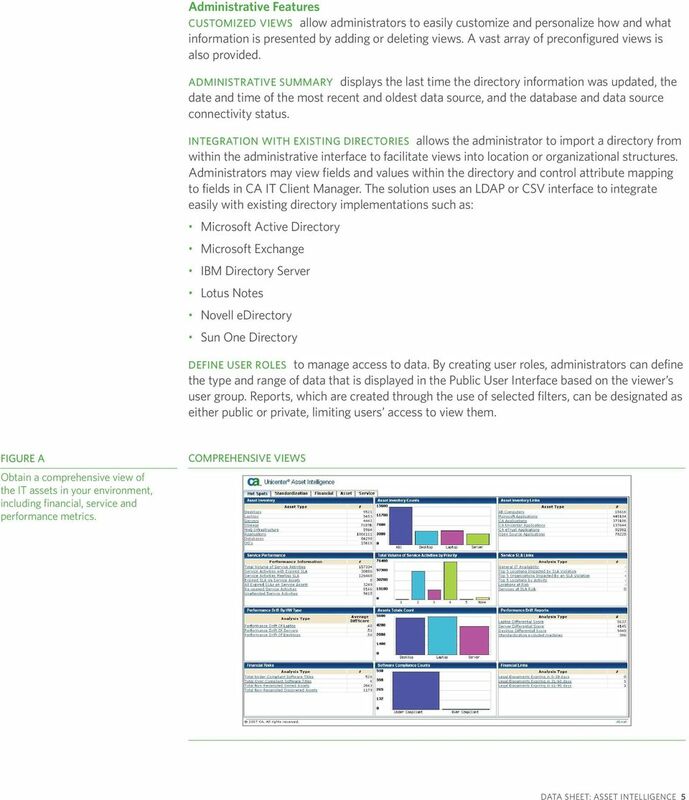 Overview Benefits The CA Advantage Getting the right information about the IT environment to enable informed business decisions used to require hours of data-gathering followed by days of analysis. 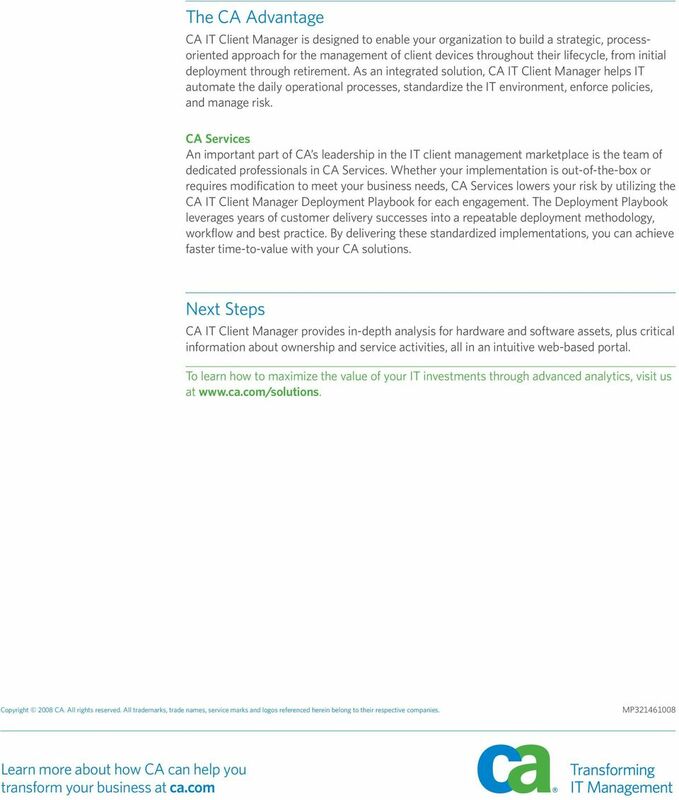 CA IT Client Manager instantly delivers this critical information with out-of-thebox analytics and key performance indicators (KPIs). It displays all of this information in a web-based portal and is designed to allow you to quickly find the information you need. 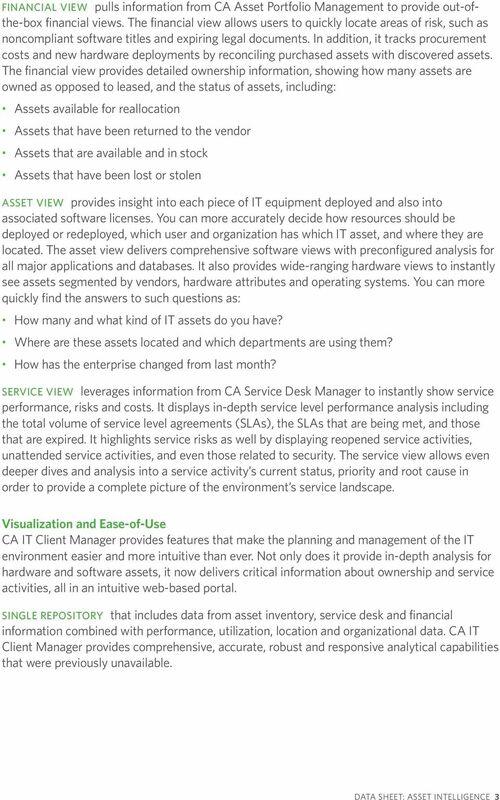 CA IT Client Manager is designed to provide instant answers to important questions when deploying or purchasing new assets, renegotiating contracts, managing service levels, and standardizing the environment. It also highlights risk exposure and pinpoints areas of concern in a number of ways with instant views of unsupported operating systems, missing antivirus software, noncompliant systems and more. 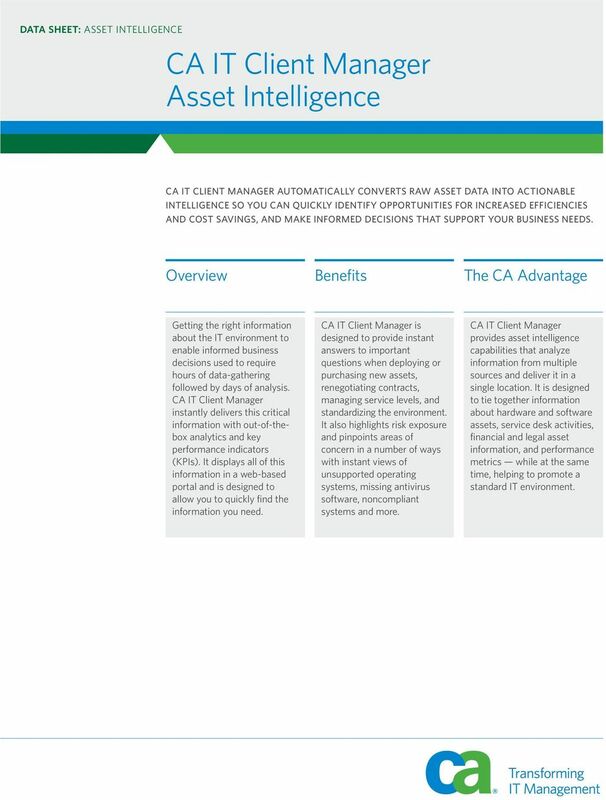 CA IT Client Manager provides asset intelligence capabilities that analyze information from multiple sources and deliver it in a single location. It is designed to tie together information about hardware and software assets, service desk activities, financial and legal asset information, and performance metrics while at the same time, helping to promote a standard IT environment. 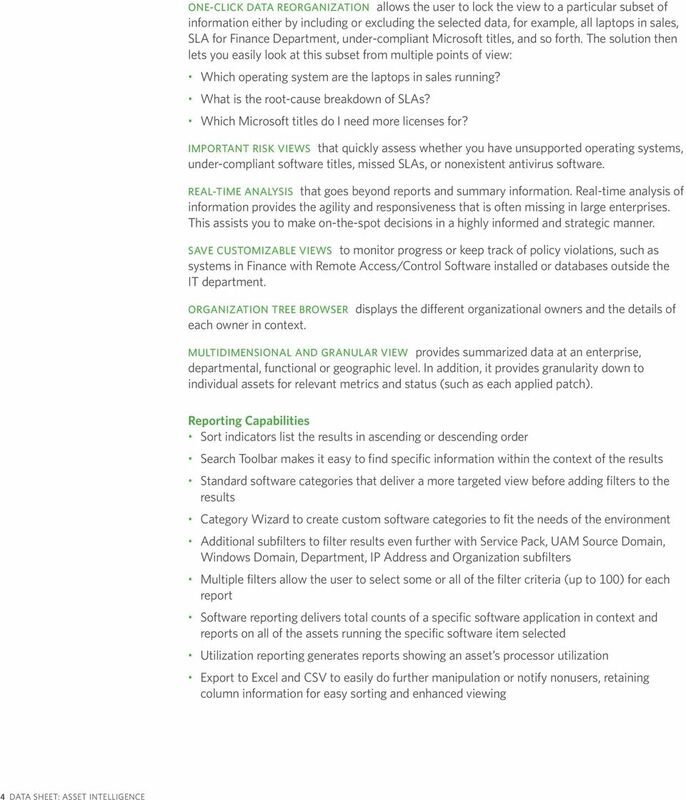 SOLUTION BRIEF CA Client Automation October 2010 can you streamline IT operations, drive greater efficiency, and reduce costs? The management of print is easier with the right tools. EXCEL-BASED BUDGETING Microsoft Excel is the world's most popular tool for complex, graphical budgeting, and we have automated the process of sharing budgeting information between eenterprise and Excel.